For more than a decade their story has thrilled, obsessed, and consumed me. Today I am delighted to be able to share it with the reading public. 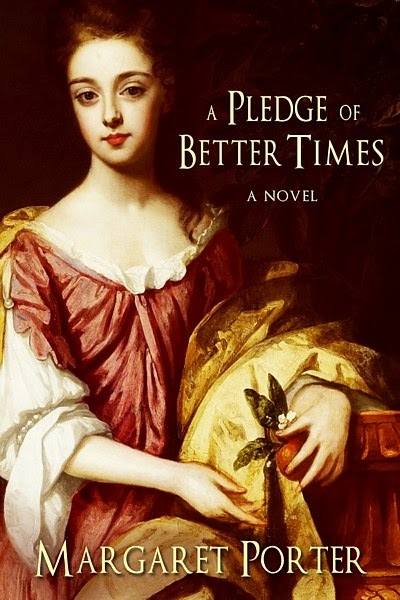 A Pledge of Better Times is the story of Lady Diana de Vere, daughter of the 20th Earl of Oxford, Charles Beauclerk, illegitimate son of King Charles II and actress Nell Gwyn, and Diana's friend, Queen Mary II of England. My heartfelt thanks to everyone who supported me in various ways during this lengthy effort to finish my 12th novel and see it published. Writing is regarded as a solitary occupation, but in fact no writer can be fruitful or sane without the presence and assistance of others. The phrase 'it takes a village' comes to mind. And it most definitely takes an entire writing community to nurture and sustain my creative life. This photo from August 2005 shows my workspace view at our lake cottage. That pale pink binder was my earliest research notebook. 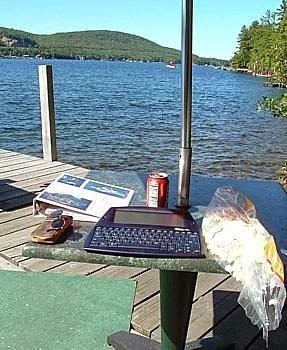 When down by the water, I either composed on my Alphasmart keyboard or wrote in longhand. 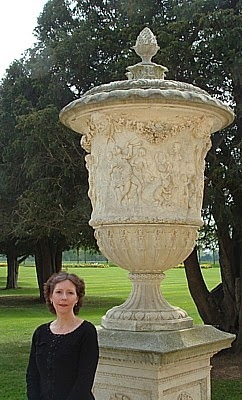 The photos below were taken during the first of two UK trips in 2006. 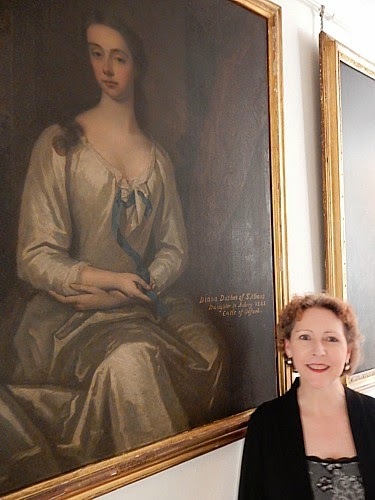 I was visiting Hampton Court Palace, to view the lovely full-length portrait of Diana de Vere, 1st Duchess of St Albans, a portion of which graces the cover of my novel. No, it didn't take me all of 10 years to research and write this novel. Along the way there were distractions and other demands upon my time. I served two terms in my state's Legislature. I was involved with two diocesan bishop search committees. I volunteered with other nonprofits. I travelled--admittedly most often to England, Holland, Belgium, and France--in pursuit of my characters. Discovering everything I possibly could about Charles Beauclerk, 1st Duke of St Albans, his relationship with Lady Diana de Vere, her father the Earl of Oxford, and Queen Mary II of England has been at times frustrating, humbling, and exhilarating. In November, as the book was about to go to press, I discovered a hitherto unknown portrait of Diana. Was it my reward for at long last reaching the end of our journey together? I like to think so.